Joe likes talking about the draft (not the combine; but the draft) almost as much as he likes talking about the virtues of Rachel Watson. But mock drafts before free agency are, in many ways, like shooting darts blindfolded. 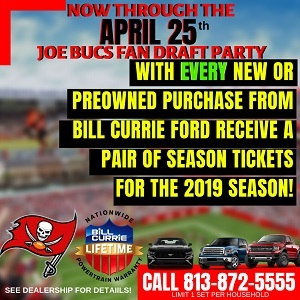 Until the siren beginning free agency blasts on the afternoon of March 12, Bucs fans won’t know every player available, and who is out there very well could determine how a team drafts a month later. Take the Bucs and Wes Welker, for example. Woody Cummings of the Tampa Tribune, speaking on “The Fabulous Sports Babe Show” last week on WHNS-FM 98.7, seemed to imply Bucs rock star general manager Mark Dominik was possibly eyeing Notre Dame tight end Tyler Eifert. Cummings, rightfully, acknowledged that the Bucs’ two main areas of need (right now) are cornerback and tight end. Since the cornerback talent in the draft is three-rounds deep but not necessarily top-shelf heavy, Dominik could elect to pull the trigger on a tight end at No. 13 with Eifert. But if Wes Welker is available as a free agent, that could change Dominik’s draft strategy, Cummings told The Sports Babe. Of course, all of this is moot if the Patriots and Bill Belicheat tag Welker again with the dreaded franchise label. Though it doesn’t seem as if Belicheat will tie up that much cash to a 32-year old slot receiver. Cummings didn’t mention this, but if the Bucs do target Welker as a big-money signing, it also speaks to how there aren’t really any big fish out there among free agent corners. Some solid ones, but none to break the bank over. In other words, cornerbacks that are available through free agency are more budget buys this winter. This is the predicament the Bucs now face: Perhaps no team needs corners more than the Bucs, but there are few top-shelf corners available in free agency, and even less first-round talent in the draft. broken down old war horse…this roster is still building with youth….he will go to a team that is already a contender for next years final games……. NE did this last year with Welker. They let him “test” the market and he did not “test” out very well so he stayed at NE. Welker ‘s success is due to his being a product of the NE system and Tom Brady’s amazing accuracy. My take, Welker is good at running routes and timing patterns, but he is too small, old, slow, and injury prone to make him a “weapon” for Freeman. The Bucs would over pay for what they could actually get out out Welker. They are more pressing needs than a slot receiver right now. Some Quarterbacks make receivers better, we need a great offense that makes our QB good. Freeman is off target to our large receivers. If Welker came to Bucs he would have 1 reception per game with 5 targets. Nonsense. Just like everything else that comes out of Cummings mouth. What?! DT and CB are the strongest positions in FA this year. There are 10-12 guys at each position that could be upgrades for us. You are clueless. And boom we sign two corners for same money, and wehave two solid, veteran CB’s that can hold us down for the next three years. I think DT, is perhaps the MOST important position in all of football. If we drafta DT, I will be veryyyyyy happy. Depth man. It can make or break you. I say we draft a d-lineman. A TE? Are you kidding me!??! We can probably find Mike Williams, the TE from Alabama, in the fourth round. He is HUGE and a monster blocker. Zack Eifert is GREAT. Dont get me wrong. But at 13? No thanks! Think we can all agree that most players that will be out there in FA have their warts, or they wouldn’t make it to FA in most cases (understand there are money exceptions). Trick is for Dom & Co. to find the ones that have the least and especially avoid the ones with the contagious types. Ok I’m getting tired of people saying we need a shutdown corner. Shutdown corners are extremely rare. You can count on one hand teams that have them. WE NEED STARTERS AT CORNERBACK. There are plenty of starters in free agency and in the draft at corner. As for Welker I wouldn’t want him because Freeman is not the type of quarterback Welker excels with. He needs a guy that is very accurate, something Freeman is not right now. I would rather see us get one maybe two corners in free agency. Resign Bennent and Miller. Sign Martellus and then draft Kenny Vaccario and Xavier Rhodes in a trade down trade up. If your gonna throw money at wes welker the 32 year old white stud.. Leavin his prime… Why not atleast throw it at Percy harvin with a 3rd round draft pick. Who will make a HUGE improvement on kick off and punt returns also. Or even throw it at dashon Goldston the hitting machine from the 49ers, saftey. It would be awesome to have Wes Welker on our team. For my own selfish reasons it would be really nice to put my own last name on my Buc Jersey. That’s because Wes is my cousin. My wife was born in Boston, so she’s a huge Patriot fan, and she also has Wes’s jersey. I was messing around with her and her mom during the Super Bowl and I told them that the Patriots won’t resign him and that he will be signed by the Bucs. They were unhappy, but how cool is that for me? When people know you have money, they try to sell you anything and everything! This team is terribly out of balance in terms of salaries paid to offense vs. defense. I’m not really in favor of spending big money on a 32 year old slot receiver. And really, does another highly paid receiver make sense on a team that is trying to sign its #2 receiver to a contract that will undoubtedly consume several million? Also, isn’t this supposed to be a running team? I just don’t see a 3rd receiver as being a good investment in this offense. Are there really going to be enough catches to go around between V-Jax, Williams, and Welker? One of these guys (most likely Welker) would end up as the most expensive decoy in the league. Not to mention, don’t we still plan on building this thing up with younger players? And by the way, Roy Cummings has no f**king clue. For a guy allegedly covering the Bucs beat he is horribly ill-informed. We can upgrade the CB position in FA. Sean Smith, Derek Cox, Greg Toler, Bradley Fletcher, Keenan Lewis, DJ Moore and Leodis McKelvin very good punt returner, they would all be upgrades to the roster. DT Desmond Bryant, Vance Walker, Sammie Hill, and ? ?…could see Bucs going DT in first round of draft. Id be all for wes welker but Freeman cant even throw accurate passes to a 6″5 Vincent Jackson let alone a 5″8 wes welker! My thoughts exactly for the last few weeks of all this free agency talk. I cannot see them spending much money on offense this offseason. Schiano wants to be a running team that works the deep passing game off of play action. We already heave that personnel, they just spent most of the year on injured reserve. I could see us maybe drafting another big bodied WR and new starting right tackle, trying to aquire a better blocking TE, and getting more depth all the way across the offensive line, but beyond that it’s time to invest some money into this defense. A lot. But Welker is not the answer. We need four receivers who are 12 feet tall, run a 2.6, and are licensed therapists. Freeman was 29th in completion % last year, and is less than a 59% passer so far in his career. While he did throw for a record amount of yards, he left a lot on the field as well. Hard to dispute though numbers, though I’m sure some will try. No to Welker. Spend that $$ on CB and maybe TE Bennett. We can have 3 Jerry Rices out there but if Free cant improve his accuracy and inconsistancy it doesnt mean a thing. There is PLENTY of talent out there at CB in FA to make a major impact on our team. I’m not a Wes Welker fan and I don’t think Dom will waste his precious coin on a guy like him. He’s dropped a number of crucial passes over the last couple years. Don’t think the Pats want him either. I’m very much on the fence when it comes to Freeman. However, I totally disagree that he has so many weapons. We have 2 WR’s and a RB. That’s it. What if one of those receivers go down? Chances are they will at some point. We have no slot WR and no TE, and absolutely zero depth. Does he have better weapons than New Orleans? Atlanta? SF? Dallas? NY Giants? Denver? Houston? Baltimore? Should I go on? If Jackson or Williams gets hurt, I would venture to say we would have one of the worst WR core in the league. I guess you guys are comfortable going with Underwood and Benn as your WR’s, but I’m not. None of this excuses Freeman for some of the performances he has had. At times, he has been awful. But it is ridiculous to make as if he’s got this stable of great weapons on this team. If you have the opportunity to get better players and build depth, you take that opportunity. Do the Giants stop drafting pass rushers? I just don’t think Weller is the guy and especially not for the price. I’d rather see the Bucs take a shot on a draft pick or folkie FA. I don’t think Welker would play for less than 5-7 million, he probably wants 10. If he was a mil or 2 then take a look but they can so better. Even in the playoffs this year he was dropping passes. Welker makes the tough drops. I’m not a fan I admit. Pay 3 CBs, Henry Melton, Dashoun Gouldsen if available. Dereck cox and Greg Toler while your at it. If we sign an aging vet, let it be Ed Reed. I would love to sign/trade for Revis. That would be outstanding. Welker dropped alot of passes, I would not mind him if he can hold onto the ball….i would love to see Ertz or Eifert in a buc uniform. The guy has averaged 96 catches in 8 years for an average of 1070 yards a year. That’s better than V-Jax’s career to this point. I don’t understand the dissing comments. He would help any team he goes to right away. Heck if he caught half that amount of balls for us next year it is more than what all our slot receivers combined did last year. To many weapons? If we had someone to catch underneath we’d be unstoppable. Man people on here are funny. Different note, Cary Williams and cox then draft a corner and we should be good. I want Amerson in 2nd rd and play him at free safety. I don’t know if Welker is the answer or not. Short term, I guarantee you he won’t hurt. However, I would rather take the chance on Percy Harvin. Even if we can just get a 2 year honeymoon period with Harvin, he would probably be more productive than the much older Welker. If we can get him for a third, I say go for it. If he ends up being nothing but trouble and somehow forgets how to run fast and score TD’s (not likely), then we threw away a third round pick. Then again, we’ve thrown away a few third round picks in our day anyway, so what’s the difference? But if he ends up being anywhere near as good as he has been during his time in Minnesota, then we are literally robbing them. Part of being a NFL coach is learning how to manage difficult, but highly productive, players. I think Schiano can deal with Harvin. Trade our 1st for Revis, and trade our 3rd+ extra 4th for Harvin. These would be two guys worth paying. Someone needs to lay off the bourbon. We have 2 WR’s and a RB. That’s it. That’s a lot more than most teams. What if one of those receivers go down? What if worms had guns? Robins wouldn’t f’ with them. We have no slot WR and no TE. Dallas Clark, though over the hill, is still OK. Does he have better weapons than New Orleans? Oh, and Joe will take Freeman’s weapons over Tom Brady’s as well. If Jackson or Williams gets hurt. Where would any of those teams above be if their stars went down? Since when did teams suddenly have Jerry Rice and Cris Carter sitting on the bench? If worms had gun, Robincrats would ban them. Are you seriously openly wondering just how many good receivers a QB needs? How about five? Other than Williams and Jackson, the Bucs had absolutely nothing last season… and considering the strengths of Williams and Jackson, they had no receivers that were adept at getting open and catching the ball on short and intermediate passes. Their TE couldn’t get separation from a shopping cart in a parking lot, Underwood was terrible in that role last season. The team needs a standout in the slot, or at least somebody that is average. The two previous seasons, Freeman had Preston Parker and Sammie Stroughter. Neither one of them are great, but they are/were far better than what we had last season, and Freeman didn’t have a problem finding them the two previous seasons. I’m not so sure about paying for a season or two rental on an 32 year old WR like Welker. Amendola, Edelman, and others are available, for less and for longer. Tavon Austin, if still around, could be a relevation in round 2, Texas’s Marqise Hill looked like a stud in the Senior Bowl and should be there in round 3. Both are the type of players that make long successful careers living in the slot in the NFL. Not a chance. We already have the most expensive offense in the NFL. After hashing out a new contract with Mike Williams, are we really going to have three receivers making $7+ million a year? No way. There’s just no way. You don’t need to spend that kind of money to find a capable slot receiver. So you really believe that we have better players than Baltimore? Better than Golden, Smith,Pita, and Jones? Are you high? That’s an absolute joke, and you would get laughed out of a room for suggesting that. You’d take our 2 guys Witten, Austin, and Bryant? Really? And no we don’t have Dallas Clark, because he’s not under contract and doesnt seem to be overly interested in coming back. But we do have Luke Stocker, who’s obviously much better than Jimmy Graham. Just because we have one guy who has ever caught 1000 yards doesn’t make us a team full of weapons.